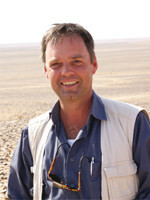 Dr. Bernd Müller-Neuhof is directing an archaeological survey project in the arid Northern Badia in NE-Jordan, which is funded by the Deutsche Forschungsgemeinschaft. This project focuses on the documentation and characterisation of socioeconomic activities in this region between the 5th and early 3rd millennium (Chalcolithic and Early Bronze Age). His research interest are focussing among others on the cultures from the Neolithic to the Early Bronze Age periods in SW-Asia, lithic technologies, early mining and quarrying of mineral resources, prehistoric trade, early nomadism, conflicts and warfare in prehistoric societies. April 30 – May 4, 2012 Congress 8th ICAANE (International Conference on the Archaeology of the Ancient Near East) in Warsaw, participant, lecture on “Desert irrigation agriculture Evidences for Early Bronze Age Rainwater-Harvesting Agriculture at Jawa (NE-Jordan)”. July 6, 2012 Colloquium “Looking for new opportunities: Late Neolithic to Early Bronze Age human activities in the Jordanian deserts”, organiser, at the Deutsches Archäologisches Institut, Orientabteilung, Berlin. March 5, 2012 Lecture “Jawa”s Hinterland? New Research on the Black Desert and the Late Chalcolithic / Early Bronze Age of the North-eastern Badia of Jordan” at the Council of British Research in the Levant in Amman. January 1, 2012 Lecture “Jawa”s Hinterland? Neue Forschungen zum Spätchalkolithikum und zur Frühbronzezeit in der Nördlichen Badia (Nordostjordanien)” am Institut für Vorderasiatische Altertumskunde der Freien Universität Berlin. 2011 July 13, 2011 Lecture “Bergleute, Händler und Viehhirten: Aspekte prähistorischer Wirtschaftsformen in der ostjordanischen Wüste” am Auswärtigen Amt, Berlin. July 12, 2011 Workshop “Current Research on Protohistoric Settlement in Desert Areas of Jordan”, participant, lecture on “LC/EB Flint Mines in the Northern Badia”. 2010 November 3, 2010 Lecture “Only Sand and Stones? The Economic Relevance of the NE-Badia in the Late Chalcolithic / Early Bronze Age: First Results of the German Badia Survey Project” at the German Protestant Institute of Archaeology in Amman. June 7-12, 2010 Conference 11th ICHAJ (International Conference on the History and Archaeology of Jordan), participant, lecture on “LC/EB Quarrying Activities in the Northern Badia Preliminary Results of the Cortex-Tool Quarry Site Survey in the Greater Ruwayshid Region”. April 12-16, 2010 Conference 7th ICAANE (International Congress on the Archaeology of the Near East), participant, lecture on “SW-Asian LC/EB demand for “big-tools”: specialised flint exploitation beyond the fringes of settled regions”.